The Catalina Super Coil Divan Set by Airsprung features our Catalina Super Coil Mattress on a matching Divan Base to ensure a perfect combination to provide you with a great night's sleep. The Catalina Supercoil Mattress by Airsprung core contains a firm, supportive yet comfortable Airsprung Supercoil 5 ½ inch spring unit. This is then topped with a layer of soft white polyester, adding further comfort to the mattress. The beautiful Belgian damask cover on this mattress features parallel stripes (available in a nautical style navy blue or a sandy beige) on a crisp and clean white background. The wavy lined colour contrast border makes this mattress an eye catching design whilst the hard-wearing multi quilting ensures a longer lasting mattress. The extra finishing touches include flag stitched handles and air vents for circulation adding to the quality of this mattress, giving you a mattress that not only looks good and feels great too. 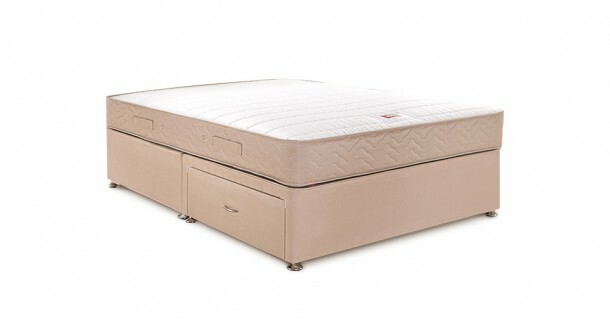 The Catalina Supercoil Mattress by Airsprung is of a medium firmness rating. This would make an ideal choice of mattress for those who prefer the support and comfort that a standard medium mattress has to offer. This wonderful mattress by Airsprung offers some lovely finishes touches and it brings a feel of luxury without breaking the bank. Please quote this Products's code 02100DS to speed up your query if related. by Airsprung features our Catalina Super Coil Mattress on a matching Divan Base to ensure a perfect combination to provide you with a great night's sleep.